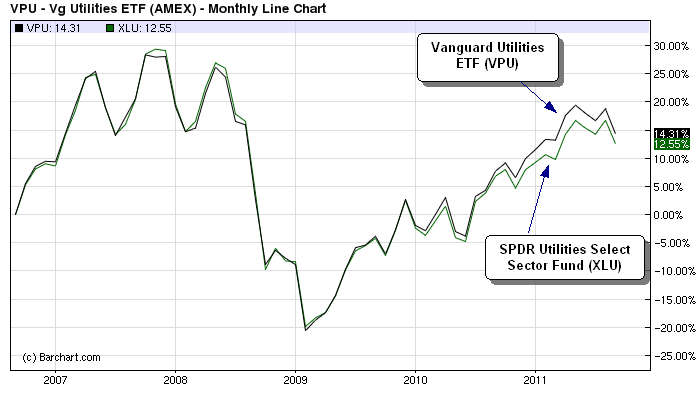 Our choice for the “Best in Class” for the U.S. Utility group is the Vanguard Utilities ETF (NYSEARCA:VPU), due to its better performance over the past five years relative to the SPDR Utilities Select Sector Fund (NYSEARCA:XLU). XLU is the granddaddy in the group, with $6 billion in assets under management, but we do not regard this as a huge advantage considering Vanguard’s VPU currently has $700 million in assets under management, which is more than enough to provide liquidity and narrow bid-offer spreads. We also like VPU because it holds 85 stocks, which makes it more diversified and less subject to single-company risk than XLU, which holds 35 stocks. VPU has a slightly higher expense rate of 0.24% versus 0.20% for XLU, but this is more than offset in our view by the higher returns provided by VPU in recent years. 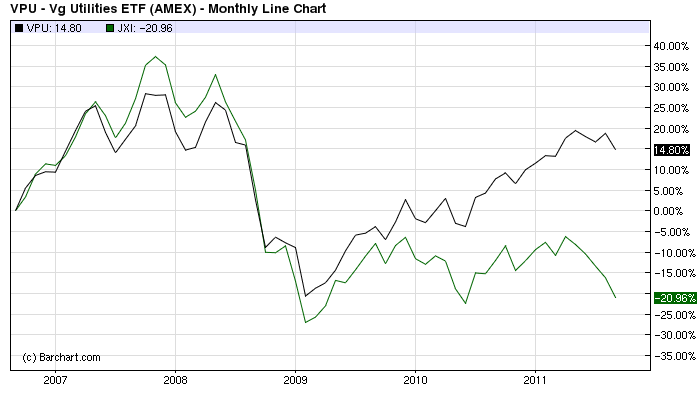 The better performance can be seen in Figure 1 on the overlay chart. We are choosing VPU over the iShares Dow Jones US Utilities Sector Index Fund (NYSEARCA:IDU), the third-largest ETF in the sector, because VPU has also provided better returns than IDU. In addition, the expense fee for VPU of 0.24% is substantially lower than 0.45% for IDU. The other ETFs in this group have relatively low assets under management and in our view do not compete well against the larger ETFs in the group. The iShares S&P Global Utilities Index Fund (NYSEARCA:JXI) is the only ETF of any substantial size in the global Utilities ETF group, which means it is our choice for the Best in Class for this group. This fund has $225 million in assets and an expense fee of 0.48%. The other ETFs in this group have less than $30 million in assets and their longevity is therefore questionable. As for our Best in Class choice for the Utility sector overall, including both U.S. and global ETFs, we are normally more favorably disposed to a global ETF rather than a domestic U.S. ETF, because of our strong belief in the theme of global development, and because of academic studies showing that the average American investor is underinvested in non-U.S. stocks. 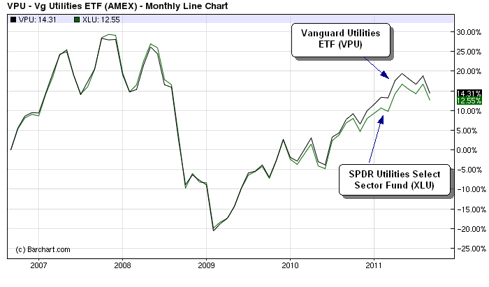 However, in the case of the Utility ETFs, the only substantial global Utilities ETF, JXI, has woefully underperformed the VPU, which is our pick for the U.S. Utility ETF sector. JXI has performed so poorly that it is barely above its 2008/09 financial crisis lows and has unperformed VPU by a remarkable 36 percentage points over the last 5 years, as seen in Figure 2. Our choice for Best in Class for the entire sector is therefore VPU. 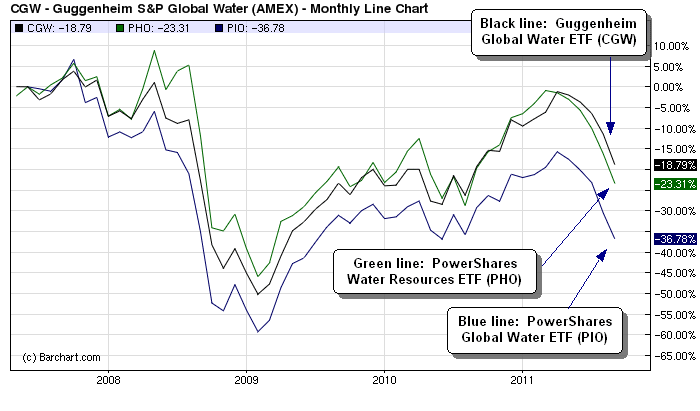 Water has become an investment theme in its own right. Clean water for human consumption is a critical resource, but is not in unlimited supply. In fact, many underground water aquifers are being depleted at alarming rates, and clean water is simply not readily available in many parts of the world. Better technology is needed to clean and treat waste water, and for desalination. Water infrastructure in much of the developed world is old and decrepit and needs to be replaced. Water usage for industry and agriculture are also large industries. Demand for water will grow substantially in coming years and decades, as the world population steadily increases and as business expands. Some of the companies in this segment are utilities that provide water to customers, such as American Water Works (NYSE:AWK) and Aqua America (NYSE:WTR). However, many of the companies in this sector are not utilities, but are instead involved in technology and services related to water. For example, Nalco Holdings (NYSE:NLC) provides industrial companies with services and technology that helps to reduce their water usage and costs. Valmont Industries (NYSE:VMI) is mainly involved with irrigation solutions for agriculture. Tetra Tech (NASDAQ:TTEK) provides water management and infrastructure services. Best in Class in the water ETF group – In the water ETF group, two of the ETFs include only U.S.-listed stocks, while the other two include globally listed stocks. For an investor who would like to stick to an ETF with only U.S.-listed stocks, our choice for the Best in Class is PHO, mainly because of its much larger size at $880 million in assets under management versus its much smaller competitor FIW, which currently has only $50 million in assets under management. 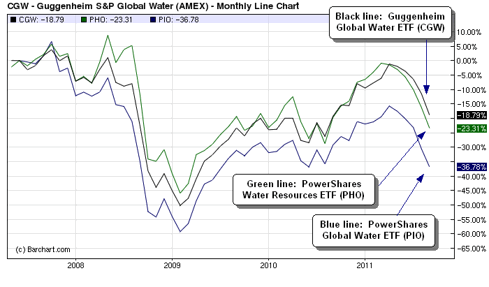 Of the two water ETFs that include globally listed water stocks, our pick is CGW. It substantially outperforms PIO on a monthly chart, as seen in Figure 3, as well as on a weekly chart. Our Best in Class choice for the overall water group, including all four water ETFs, is CGW, due to its better performance than its competitors. In addition, choosing CGW over PHO, which has only U.S.-listed stocks, is in line with our general preference of choosing global ETFs over ETFs with just U.S-listed stocks, because of our strong belief in the theme of global development and the faster-growing business opportunities in the developing world.